Rinse and dry each eggplant and slice them in half. Score each half in a diamond, cross-hatch pattern. Place all 6 halves on wire roasting rack. Heat oven to 400 degrees and cook for 40 minutes. While the oven is heating up combine all ingredients in order, in a mixing bowl. Using a mixer on a low setting mix dough until it forms a ball. Cover and set dough aside for 40 minutes while the eggplant roasts. Let the eggplant cool for about 10 minutes. Add the onion and red pepper along with some water, curry powder and tamari and saute for about 10 minutes. Once the eggplant has cool scoop the inside and place in a food processor along with the tomato paste and kirmizi biber. Puree until ingredients are combined. Add the sauteed onion, red pepper and parsley and pulse to break down. The vegetables shouldn’t be completely broken down, but have some minor chucks. Once the dough as risen, roll it out and divide into 4 separate pieces. With a rolling pin, roll out each piece of dough to resemble a single serving pizza. Top each piece of dough with the eggplant mixture. 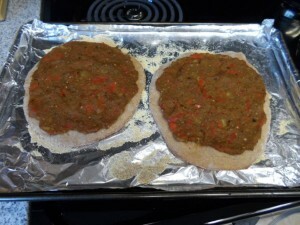 Cook each Lahmucan for 15 minutes at 400 degrees. Notes: This was also the second time I made Lahmucan, the first time time from Vegan Magic, which I think lacked flavor. I continued reading other sites and saw a pureed eggplant mixture using assorted spices. Not sure the tamari was needed when sauteing the onion and red pepper. If you are not a curry fan, you could probably do without the powder and not lose much flavor. You can adjust the amounts of flours to your liking. I do want to try spelt and besan. Lahmucan can be eaten folded up, but with the dough recipe above it was not very pliable and the dough ended up tearing as I ate away. Source: I pulled this recipe together referencing a few different website including Vegan Magic and Food Network. In the ended I combined what I read into my own recipe. In a food processor combine the cashews, soy milk, nutritional yeast, lemon juice, garlic, Bragg’s Liquid Aminos, dry mustard and black pepper. Blend until smooth. Clean the spinach and add to the food processor. Finally add the artichoke hearts and pulse, in order to leave the artichoke chunky. Place in the oven and bake at 375 degrees for 20 minutes. Notes: I use my wife as verification to how a recipe tastes. If she likes it, then I see the recipe as a success. The first time I made Dreena’s dip, my wife didn’t like it, as she though it was bland. This was why I modified her recipe, adding nutritional yeast and substituting Bragg’s Liquid Aminos (or Tamiri) for the 3/4 tsp of salt. I feel the nutritional yeast gives a bit of a creamy and cheesy taste, but it’s not overbearing. Soak the peas overnight. Rinse well. Cook onion, celery and garlic in soup pot with salt (optional) and pepper. Stir until they just start to turn translucent. Add peas and fill pot until water is approximately 2 inches above the level of the peas. Bring to a boil. Turn down heat and simmer for 90 minutes. When soup is done add water if it’s too thick. Be careful, too much water will make the soup thin and watery. When the peas are soft add grated carrots for the last 20-30 minutes. Notes: This recipe originally contain the ham hocks, but is just as hearty and flavorful without them added. You could add the ham hocks prior to boiling your peas if desired. This recipe also called for a “heaping palm full” of salt prior to boiling as well. It is not needed, any salt can be added after the soup is finished. Source: This is a family recipe from Paula, my boss at work. NOTES: This is a basic hummus recipe, please feel free to experiment adding different combinations of ingredients to create different flavors of hummus. I currently have a cilantro hummus and a tomato basil hummus I make on a regular basis.